Having found a suitable site for planting a new woodland and decided what kind of trees to plant, the next step is to consider the layout. There are various decisions to be made – whether to plant in straight lines, curved lines or at random; whether to include glades, rides and ponds etc – but the most important consideration is how far apart to plant the trees. 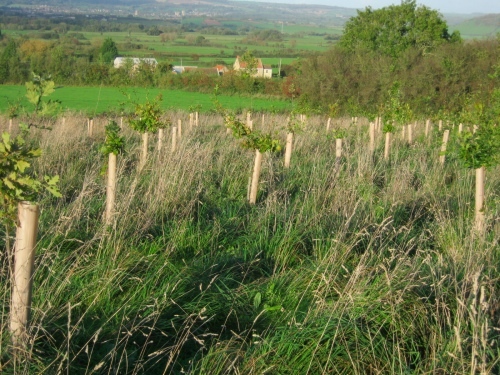 Government grants have been paid on new woodland planted as wide as 3m apart, and even when grants are not available there’s a great financial incentive to plant on a wide spacing. Planting at 3x3m requires 1100 trees per hectare but changing to 2x2m more than doubles the number of trees to 2500. Each extra tree means another tree protector and mulch mat, both of which can cost more than the tree seedling, plus the time it takes to plant them. The temptation to go for the wider spacing is clear but it’s best resisted because if they’re too far apart the trees will never be usable for timber, and not much use for coppice either. 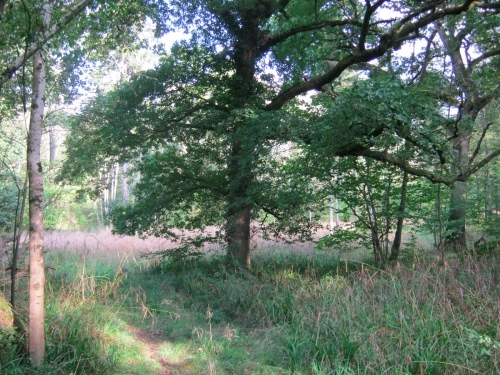 Woodland trees are planted close together, typically at 1.8×1.8m for broadleaves and 2x2m for conifers, though this does vary according to species. As they grow they’re progressively thinned until the final stand may contain as little as a tenth the number of trees that were initially planted. This ensures that the trees are always at the right distance from each other for their size. They grow up straight, seeking the sun above and their lower branches are shaded out by their neigbours. This way you end up with straight, branch-free timber which can be sawn up into planks, beams and other useful items. 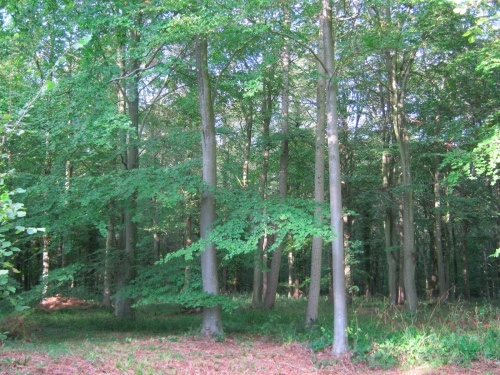 These beech trees have been planted at the right spacing and progressively thinned to give a fine stand of high quality timber. Trees planted too far apart grow up crooked and branchy. They can’t be used for timber and are very difficult to process for firewood. If the trees are grown as coppice rather than timber a wider spacing may give an adequete yield but the poles will be too branchy for craft use. Branchiness is less important for fuelwood but it’s still easier to handle wood if it’s straight – and much easier to split it.The yield of the plantation will be lower at a wider spacing too. This oak, though a fine tree in many ways, has grown without close neighbours and will not make good timber. The cycle of growth in a tree plantation is very similar to that of a natural woodland, where seedlings come up thickly, often thousands of them in the space that will eventually be occupied by one tree. Ash seedlings are particularly prolific and you may have seen them come up like a carpet under a mother tree. Throughout their growth the young trees compete with each other and the vast majority die before they reach the canopy. Where natural regeneration happens on previously unwooded ground a common pattern is for the first generation of trees to grow up as isolated individuals, followed by the usual dense mass of seedlings in the second. We always plant trees for future genenerations. Trees are so long lived that the person who plants them rarely sees them mature. So we need to bear in mind the needs of people who will live perhaps 100 years after we’re gone. These trees have been planted much too far apart and will never yield a usable crop. 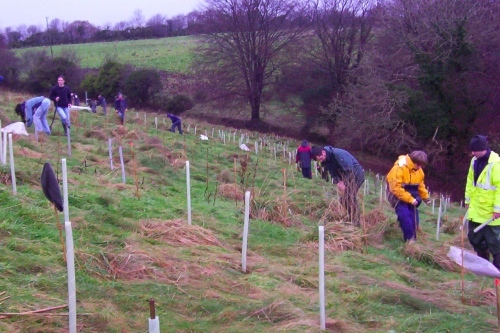 These days some people plant at a wide spacing, thinking only of the ecological, wildlife and visual outputs of tree planting, and saving themselves a bit of money at the same time. We can afford to ignore useful outputs in this way, cushioned as we are by an abundance of cheap fossil fuels. But future generations won’t have the same access to steel girders and heating gas that we do and will be glad of a supply of beams and firewood. The ecological benefits of tree planting are much the same however far apart we plant the trees. But if we plant them too far apart we deny future generations the renewable resources which they will need. That’s more like it! Pentiddy Community Woodland, Cornwall. If you can’t afford to plant at the correct spacing I suggest you consider planting a smaller area or spread the planting over two of more years.